These venerable, magnificently designed 202T modems, originally designed by Universal Data Systems, acquired by Motorola, then acquired by Telenetics, have been the reliable workhorse of SCADA applications since the 1990’s. They have a brilliant track record. But they are increasingly difficult to find. Furthermore, what units may be found on the secondary market are increasingly prone to failure, simply due to age. What if the Motorola UDS 202T were completely redesigned using modern, readily available components? What if the new modems were available at less than market value for refurbished 202T’s? Well there are no more “what-ifs”. 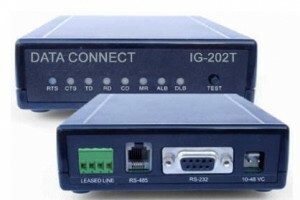 Data Connect perceived the need and brought to market the IG-202T as the best possible replacement for the Motorola units. For details click on the link below. You can always call for a quick quote on refurbished Motorola units, but we recommend these brand-new, fully warranted replacements. Stand-alone, RM-16 rack mounted , AC and DC versions are available.